Canberra will host an A-League match between Central Coast Mariners and Wellington Phoenix later this year. The clash at GIO Stadium is likely to take place in November in the early rounds of the 2016/17 season. Canberrans have demonstrated an appetite for elite sports in recent years, especially football. There were strong crowds at Canberra Stadium for the Asian Cup matches in January 2015, including two sell-out games, and another bumper crowd for the Socceroos’ World Cup qualifier at the same venue in November when Tim Cahill fired home the second in a 3-0 victory against Kyrgyzstan in front of 19,412 fans. The Mariners have enjoyed strong connections with the capital in recent years. Current Socceroos and Celtic star Tom Rogic played his junior football with Tuggeranong United and at senior level with ANU and Belconnen United before joining the A-League club for two successful seasons in 2012. Central Coast played two A-League home matches in Canberra in 2009, beating Perth Glory and Adelaide United, and in the 2015/16 pre-season the club spent a week in the capital where they played against Canberra Olympic and Gungahlin United and participated in a range of community activities and coaching clinics. ACT chief minister Andrew Barr joined with the mayor of Wellington Ms Celia Wade-Brown to announce the clash and raised the prospect of further national league games in the capital in future seasons. 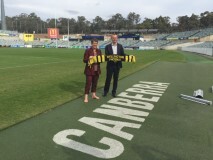 “I’m delighted that the Central Coast Mariners have partnered with the ACT Government to bring this clash to Canberra, and I hope to see many more A-League games in Canberra over the coming years,” he said. Mr Barr added the fixture announcement was further evidence of the strong relationship developing between the two capital cities, which will be linked by direct international flights starting later this year. “There are a number of opportunities for economic and cultural exchange when direct international flights connect Canberra and Wellington from September,” he said. Mayor Wade-Brown said she was delighted to see further links developing between Wellington and Canberra. “The Anzac capitals have much in common,” she said. “The best city relationships have connections on every level: economic, political, tourism, environmental, cultural and sporting. Capital Football president Mark O’Neill said hosting an A-League match would have a range of benefits for football in Canberra. “This match presents a significant opportunity for Capital Football to develop relationships and continue to grow our future prospects of bringing the A-League to Canberra on a regular basis,” Mr O’Neill said. Central Coast Mariners chief executive Shaun Mielekamp said he was excited to re-affirm the club’s relationship with Canberra. “We see this is a first step towards forming a long term strategic partnership with the region,” he said. Photo: ACT chief minister Andrew Barr and Wellington mayor Celia Wade-Brown at the announcement. GWS Giants are not out-out-towners. It was always joint team between WS and Canberra. However, I want an A-League team of our own, and not these NSW teams visiting teams here when money is waved. Name me two GWS players who are permanent residents of Canberra. Their presence in Canberra is limited to the games they are contracted to play for huge amounts of ratepayers money that is “waved” at them. The Canberra Raiders had Seiffert Oval as their venue until the Stadium at Bruce was available. There was no other venue before than that was suitable (for “international” matches either). Seiffert Oval is closer to a lot Canberrans that Bruce Stadium is. How many times has Canberra tried to get an A League soccer team? It’s just like that blue sky tram, not needed and not viable. There are strong overtones in this report that the ACT government is planning to “do a GWS” with the Central Coast Mariners. We can’t afford another “out of town sponsorship” and just how much is it going to cost us to stage the Central Coast Mariners and Wellington Phoenix match? What are the economic benefits? While the government comments on the pluses of selling Canberra to Wellington residents when the direct flights start, the Wellington Regional Economic Development Agency appears to be first out of the blocks in “unapologetically and shamelessly wooing us into visiting or moving to Wellington” through the inclusion of the Autumn/Winter Wellington Guide in today’s Sunday Canberra Times. No doubt our tourism special events man in the ACT government is on top of this.